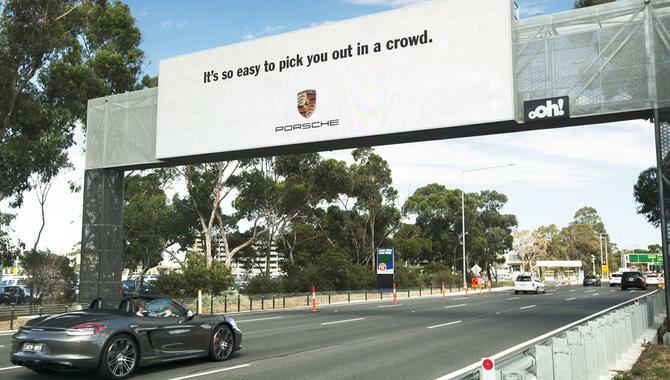 Porsche Australia has launched a new digital out-of-home advertising campaign that will display a targeted message to drivers of its luxury vehicles at Melbourne Airport. The ‘911 Turbo’ campaign was created by oOh! Media and relies on the company’s content management system, Argyle, along with IBM software to determine when a Porsche is nearby. A camera 300 metres ahead of the billboard is used to analyse the vehicle make and model to identify the right cars to target. The billboard then changes to display the targeted message. The message chosen by the brand is “It’s so easy to pick you out of a crowd”. The 50sqm billboard on Airport Drive will be operating from 10 January for five days. Porsche Cars Australia director of marketing, Toni Andreesvski, said it was important for the automotive manufacturer to be associated with new digital technologies. “ The power and flexibility of digital technology today is a real winner for high-value brands to reach just the right audience,” he said. According to oOh! Commercial director of operations and technology, John Purcell, the billboard will reach up to 200,000 travellers on their way to Melbourne Airport each week. “Ooh!’s broader digital strategy is not just about upgrading our current sites into digital billboards, it’s about creating solutions to help clients find creative ways to engage with their customers,” he added. Ooh!’s other recent digital innovation include the launch of QView and Hijacked integrated online platforms, along with its ‘parting’ technology, which enables contextual advertising on its billboards based on the temperature or time of day.